This image of Emma and Samuel Blythe is circa 1920. I believe it shows their downtown house at 601 Oak Street. This is now the site Three Rivers Grill. I know most people who visit this site are very familiar with Samuel and Emma Blythe, but here is a refresher on their lives. I think it is worth a re-read, to appreciate the lives they lived. 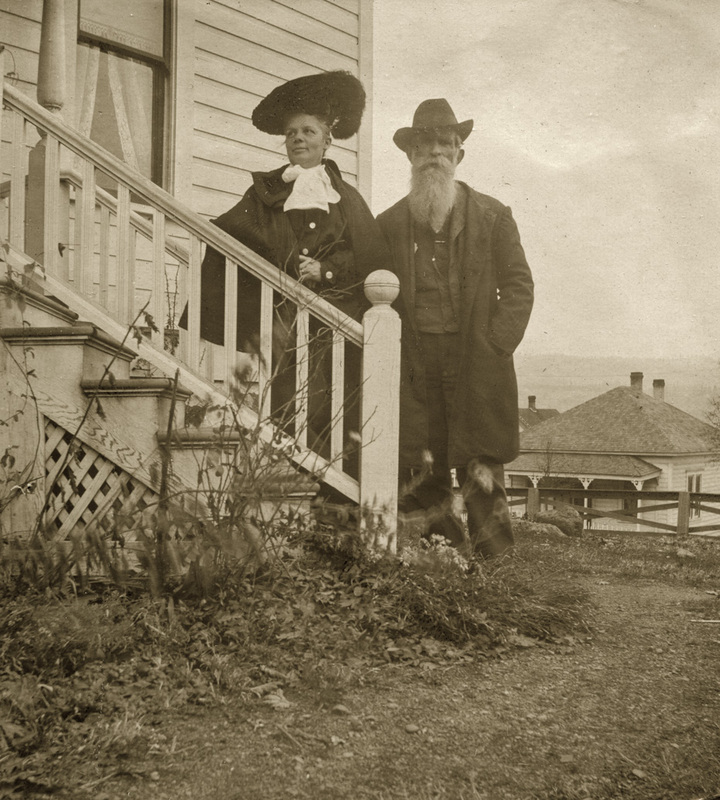 Emma's father, William Bryar Nation came to Oregon in 1871. He was an ivory turner by trade. In his last years he lived with Samuel and Emma. His beard is back in style. Not so much for her hat. Don't know if it is the case with Emma, but often times that cumbersome bowtie around the neck was to hide a goiter which plagued many women during this era. Even though they had a house in town, they definitely kept the farm. They celebrated their 50th in 1923 at Twin Oaks, with a huge celebration, re-enacting their wedding. Samuel passed away May of 1928 at Twin Oaks Farm. Emma's obituary in the December 08, 1930 Oregonian says she died at the farm home where she had resided the greater part of the last 55 years. yes,.....love the hat but how in the world did that work in HR??? was there a tie down? I have always been a lover of old hats. Used to have a bunch of very old ones and finally on a move I gave them away. Not I am sorry I did. Goiter was a very common thing in women. Both my grandmother and my aunt had that problem. The old time remedy was to rmove them. I have a thyroid problem but it is controlled by medication. I don't know but that condition seems to run in families. I don't know if it is for certain. Blythe always does have that distinguished appearance of a Civil War veteran. I wonder how often he got that beard in his food? We actually have a sample of Samuel Blythe's hair. No visible sign of food in it, Charlott, but I haven't gotten close enough to be sure. You should have seen me jump when I opened the envelope holding the hair. Not what you expect in a box full of correspondence. Exchanging locks of hair used to be seen as very romantic. Klickitat County pioneer Cody Chapman, in his memoirs, tells about visiting an old Indian in the Yakima Valley. The Indian pulled out a trunk, and asked Cody to look through it. At the bottom of the trunk were skeins of hair. Cody thought someone had cut their hair and saved it. Then he realized the scalps were still attached.